Mastering the Art of French Cooking (Vol 1) is the first serious cook book I ever owned and I know I have mentioned it elsewhere on this blog. A couple of years ago I found myself at the Oxford Symposium on Food & Cookery and in one session I spoke up from the audience in defence of this book and its authors, two French and one American, the American being the incredibly famous Julia Child. I can't really remember why I thought it necessary to defend these three, but I've got a feeling the presentation was something to do with soufflés and feminism and the soufflé wasn't coming out of it too well. This was the book that told us where we could leave off slaving over a hot stove, let the food rest, for an hour, for a day, until we were ready to take up cooking again. With nary a colour photograph, this was the book that painted a picture of culinary glory for the faint hearted. This was the book that said “you can do this…just read these six pages on how to make a soufflé and you’ll be fine.” And we were empowered. The first time I came spoon to spoon with MAFC was when I was working for Terence Conran’s Design Group in London and a colleague told me she was going out to buy what she needed to make a cassoulet. “For tonight?” said I, having no idea what a cassoulet was. “For Saturday” she said. It was Wednesday. I had never come across a dish that took three days to make. Read MAFC and you will understand why. I bought the book on the spot. I then proceeded to cook my way through it, starting with a spinach soufflé. Not that easy, but with the six pages of soufflé instructions that preceded it I felt someone was on my side. 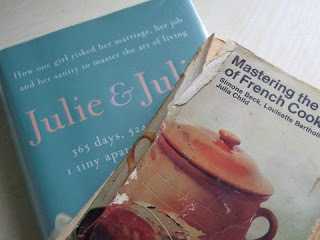 Lately I have been reading “Julie and Julia” by Julie Powell, who, approaching the watershed of 30 years and with her biological clock ticking, decided to cook her way through the entire canon of MAFC in one year, in a tiny New York flat, with a heroic husband. Now, I have to admit that I did not cook every single thing in the book when I was starting out. Anything involving kidneys, rice and mushrooms was to me hors de combat. As was anything that required making a difficult sauce only to reduce it and turn it into something completely different. I’m always sorry that Julia Child seems to have filched all the plaudits for the book, despite the fact that there were two perfectly good Frenchwomen involved in it, but there you go. So, here I am reading the bit where Julie is making braised beef a la Julia Child, and here’s me with a bit of rather indifferent beef in the fridge waiting to be cooked. Julie prepares hers; I prepare mine. How long is it since I actually marinated a chunk of not great beef in thinly sliced carrots, onions and celery, with garlic, herbs, red wine and olive oil? Too long, I tell you. I even sliced the vegetables on a mandolin, such was my enthusiasm. The scent of the marinading beef floated through the house, scenting the damp August air, but that was nothing to the perfume that trilled about the place once the dish went into the oven. I re–read the recipe; and I re-read Julie’s commentary on her own efforts; and I suddenly remembered the last time I made it myself. My in-laws were coming. Julia Child calls for a veal knuckle, or a calf’s foot, split, to go into the braise to unctuate (is that a word?) the sauce. I spent a fortune in time and petrol finding a calf’s foot in Soho, getting them to split it, then scrubbing the silken hairs more or less clean. I say more or less, because throughout the cooking there was just the faintest scent of, how can I put it, the byre. And, as Julie has it, at the end of the evening, a fleeting zephyr of hoof. My in-laws were worryingly polite. This time I didn’t even bother to go and look for a bovine metatarsal, but in deference to my current rather poor quality piece of beef I was generous with the aromatics and the seasoning. It was winey and herby and garlicky and the outer garments were just great. Unfortunately no amount of gussying up can really disguise an indifferent raw ingredient. I’m sure that Julia Child, in her Parisian garret, newly married and in love, would have had the good fortune to start off with better stuff. Revenons a nos moutons, or, as they say in France, let’s get ourselves some decent beef. The jus, however, was fab! On Saturday several good things happened. Firstly it didn’t rain, despite the forecast. The sun came out and dried up all the mud leaving the walkways feeling a bit like a rubber mat though not quite so sweet smelling. 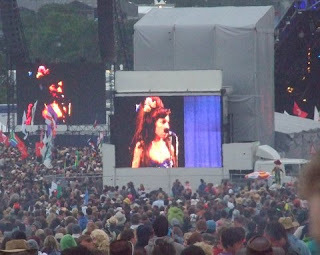 Secondly Amy Winehouse made it to the Festival, opened on time, and sort of made it through the set, although at one point she got down among the crowd and gave her minders a heart attack. 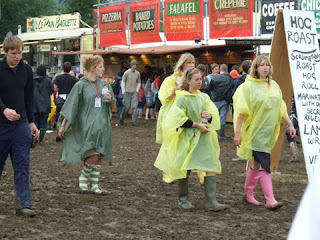 Of course the sun makes a huge difference to the day, and it was lovely to see people swap the rain ponchos for – well, see for yourself! Up at the Acoustic Tent where I listened to Thea Gilmore, Andy Fairweather Low and Seth Lakeman (who did a stormin’ set) people were singing the praises of Pilton Pasta, a bunch of local people who were offering a bowl of fresh cooked penne with simple but tasty home made sauces for a fiver. I tried the fresh vegetable sauce with mine and it was pretty delicious. 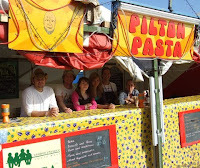 And the fiver would have been well spent because, as we know, pasta keeps you going. 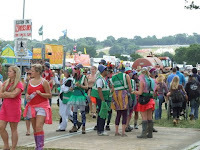 What nobody ever tells you is that Glastonbury is a tremendously physical event – you have to trudge for miles to get where you want to go, and that includes the loo! After a couple of days I’m beginning to feel the benefit of all this walking, but I am by no means match fit! This morning there are more dark clouds sailing overhead, but they just keep moving on so maybe we will be lucky and have another dry day. This is unmissable! Somerset and Avon Police have horse patrols at Glastonbury and this is the view from their riders. 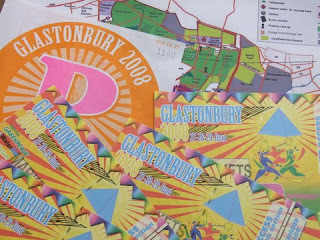 And this was the Glastonbury Festival 2008 on Friday. A little spot of overnight rain turned the hard baked earth into a sticky mire. But only on the well tramped thoroughfares so it could be worse. Still, it makes walking and staying upright quite a challenge and you work out muscles you didn’t know you have. The scale of the thing is just phenomenal. There are 150,000 people here. The population of Bath is only 90,000, and Bath covers a lot more than the 1000 acres of this peaceful valley. I watched everyone arriving on Wednesday and Thursday and I was so impressed. They parked their cars and then trudged patiently for what seems like miles to get to their camping ground. The must-have accessory is a wheelbarrow and I plan to snap up one of the leftover ones at the end for my allotment! There is food everywhere. I don’t know how people have time to listen to the music they’re so busy chomping, and that doesn’t count all the biscuits in the tents. 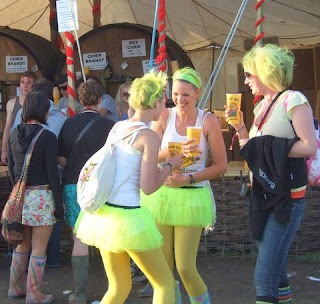 Chomp, chomp, squelch, squelch…that’s the soundtrack to Glastonbury. 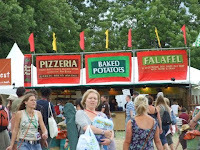 Huge queues formed around the falafel stalls – my thinking is vegetarian, deep fried, comfort food and probably safe! I was glad to find a free range chicken stand that was using local chicken, and Yeo Valley is here with local organic yogs and ices. 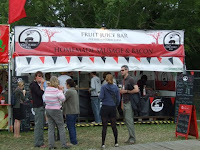 The best apple and pear juice on the park is from my favourite The Orchard Pig, who are here with their own Gloucester Old Spot sausages and bacon as well. 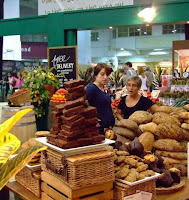 From Dorset there is Hall’s Smokehouse, offering smoked salmon and smoked mackerel in a wrap. Delicious, if pricey at £5.50. 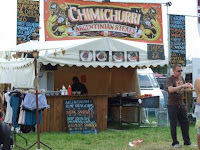 I liked the look of the Chimichurri Argentinian steak sandwiches with chimichurri sauce, again around the £5 - £6 mark and someone is doing gourmet fish and chips – haddock only – cooked to order. 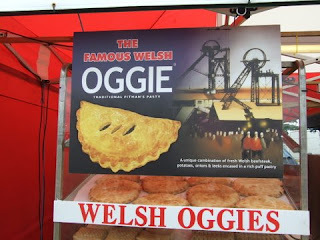 Some kids from Leeds are here with really excellent home-made lemonade, and you have to try a Welsh Oggie – Welsh steak, Welsh veggies, in a puff pastry crust so nice you can eat the whole thing. 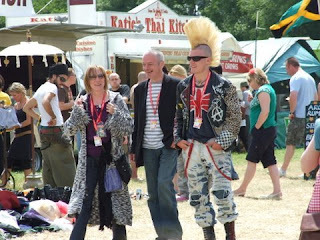 The last time I was at Glastonbury was 1973. There were a few people in a field. Now it has grown into the largest greenfield music and performing arts festival in the world. Over the past few weeks the signs have been going up and the lanes have been filled with snorting screaming lorries loaded with fencing and portable loos. The big tents have been going up for companies like Orange Mobile where everyone will be able to recharge their phones, and up on a hill there is a bunch of tipis which will house the richer Festival goers. If you’re really loaded you’ll be staying at Camp Kerala and hobnobbing with supermodels and would-be royals. I actually know someone who’ll be up there and I’m hoping the party will be at her’s! I plan to write about the food on offer, in the hope that I’ll find something delicious and tasty among the pot noodles and burgers. You never know! Everybody seems to be making jelly these days, jellies for cheese, jellies with herbs, jellies with and for everything. 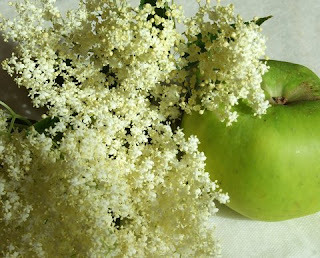 And as the hedgerows are frothing with elderflowers I thought I’d have a go at making elderflower jelly. 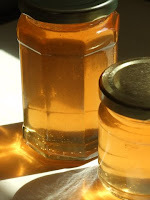 The base is a Bramley apple jelly, left to drip overnight and then flavoured with elderflowers. For this you will need a jelly bag, but if you don’t have one, or, like me, can’t find it because you use it so infrequently, just use a pillowcase. Support it on a sturdy coat hanger and hang it from something over a large bowl. Wash, core and chop the apples roughly. Put in a pan with the water, bring to the boil and simmer until very soft. Pour into a jelly bag and allow to drip overnight. Next day measure the juice and add one pound of sugar for every pint of juice. Dissolve the sugar over a gentle heat. Add the elderflowers tied in muslin. Bring to the boil and boil vigorously until the setting point is reached. Remove flowers. Add the lemon juice and allow to cool slightly. Pour into clean sterilised jars and seal. This is lovely with cold chicken, or to deglaze a pan that you have cooked chicken in. It’s also great with lamb. 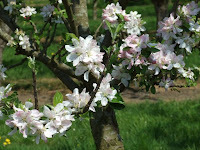 May is Apple Blossom Time in Somerset. This is when the harvest to come in the autumn starts out on its annual journey. 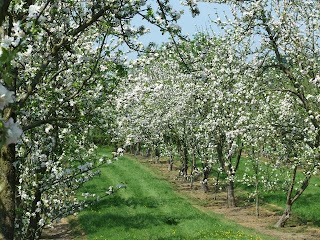 Never an easy time as wind and rain and frost can wreak havoc on the crop, but somehow the trees make it through and when the blossom comes it’s like a snowstorm in May. 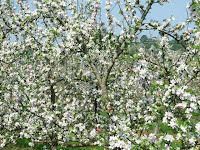 This year one of the Somerset orchards – The Orchard Pig near Glastonbury – opened its orchards to the public for the first time on Mayday Bank Holiday. The different varieties of tree come into blossom at different times, and the flowers last for no more than about a week but during that time it is a breathtaking sight. People said it was like being on a different planet for the afternoon! The Orchard Pig has 45 acres of trees at its main home at West Bradley. 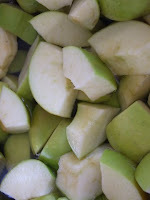 In the autumn the apples will be hand-graded and farm-pressed to make five different single variety apple juices and dry and medium cider made in the French style. Another food festival to add to the growing calendar. I liked it. I’ve been to a lot of food festivals in the last couple of years and I’m often disappointed, because the big boys always seem to crowd out the little producers, and it’s nearly always the latter that I find most interesting. 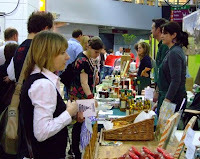 This time the stallholders were handpicked by an advisory team with impressive credentials, and attendance was subsidised. You can tell immediately if the person on the other side of the stall has had any involvement in the production of the thing they are selling, and these people were there in abundance. There were Master Classes from chefs like Barney Haughton from Bordeaux Quay in Bristol – everybody learned how to make ailloli – and tastings aplenty. I got there at 10.30 in the morning and by 11.00 I had eaten cheese, oysters, chilli chocolate chip cookies, red wine, an ice lolly, rum and olives. Oh and a monster brownie. I had to have a little sit down and an Alka Seltzer. 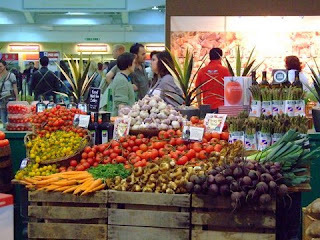 With wood shavings on the floor which reflected the light and made the cavernous exhibition centre feel like the biggest farmer’s market in the world, and hundreds of quality stalls it was certainly a foodie’s delight. The arrangement of stalls, however, with stalls all grouped together according to product, will have disappointed some producers. And with all that free tasting the people who were there to sell snacks may have felt a bit left out. Four days of festival and a setting up day means that people were away from their businesses for a long time and the first couple of days were badly attended. I think a lot of producers may stay away next year, which will be a pity as the advance publicity will be better. 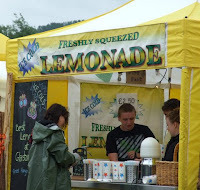 But the quality really was good and that is something that the more regional festivals could learn from.